I have always been keen to state that unless you have been on Chief & Council and/or work in the Band Administration at a senior level, you really have very little perspective and understanding of the dynamic and challenging nature of governing a First Nation. I have been fortunate enough to have worked in senior administrative or executive roles with many First Nations in BC over my 20 year professional career. It has been, and continues to be, a tremendous honour to serve First Nation communities as an Aboriginal professional and entrepreneur. The demands of essential Band operations, day-to-day Member needs (and wants), programs and services management, AANDC and funding agent bureaucracies, special projects and the broader economic and political activities are enough to make Chief & Council’s job and duty to its Members very difficult to activate. Leadership in First Nation communities is difficult and challenging – absolutely…but herein lies, in my view, the real opportunities for consequential change and community growth. Of course, you have to be able see that potential, and just as importantly have the ability and desire to take action, move forward on calculated risks, and work extremely hard…none of which is for the faint of heart. It is the neglect of truly leading that I am most critical – not of Chief & Council’s in general. Time and time again, leadership typically spends far too much time meddling in the details of what is before them and fail to focus on setting core strategic initiatives (and sticking to them) that will change the economic, social and cultural fabric of our First Nation communities. Far too often they consider their limited perspective and knowledge as subject matter expertise which leads to significant delays, increases opportunity costs, and overall frustrates and erodes confidence in their leadership. To make matters worse Chief & Council tend govern from an ‘expense’ driven outlook rather than an ‘investment’ outlook – both have very specific and very different benchmarks for success, and measurement of outputs and outcomes. 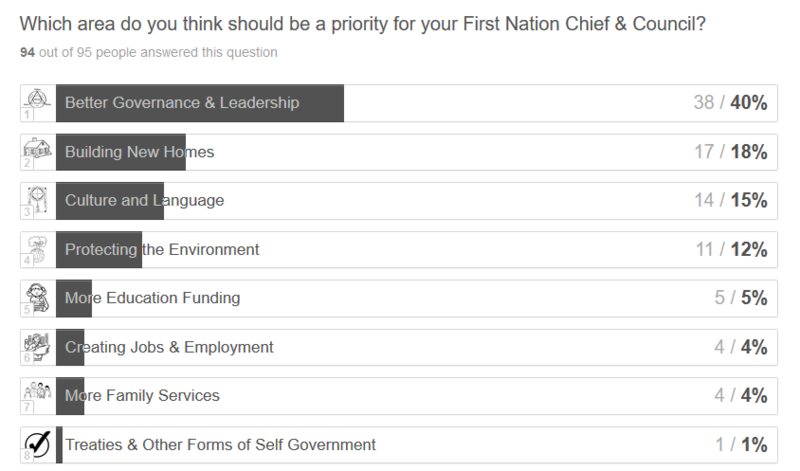 Our quick survey last week (and the comments that followed) clearly demonstrated some frustration between Members and their First Nations leadership engagement with them on Band matters – 56% said they never hear from Chief & Council at all! Similar frustration rang true on what Members typically think matters most, citing that Band Governance (40%) was the core area that their Chief & Councils should set as a clear priority objective. 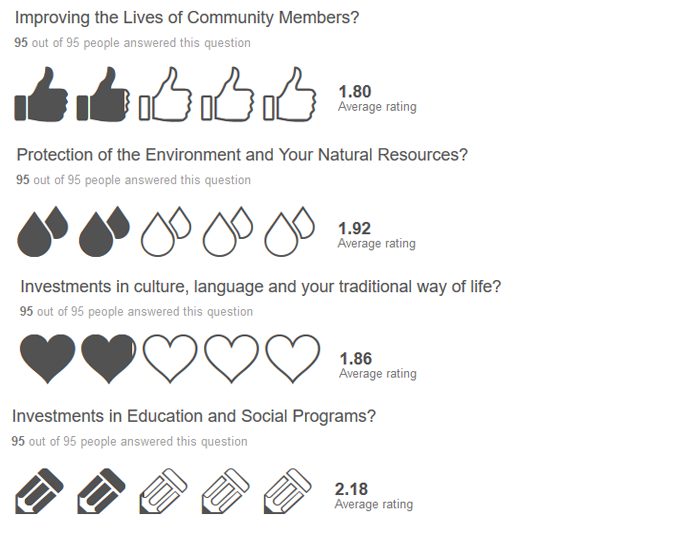 70% of respondents also indicated that they felt their First Nation was either going in the wrong direction or were unsure of that direction. Clearly a major disconnect exists with Members…Leadership should be finding ways to close that gap and connect with their Members more effectively and meaningfully. For example, a strategic investment in staffing, projects and programs and services leads to a measurable beneficial return to a community and organization. An investment outlook approach also provides key benchmarks along the way that determine compliance or non-compliance of the outcomes and outputs expected (based on data, facts and predetermined criteria – not political angst or other immaterial considerations) along the projected work-plan or project path. In the event of non-compliance with expected results, Chief & Council can make the necessary changes specific to keeping the initiative on track or in the event of major issues abandon the initiative with defensible reasons and logic. Ultimately, always ensuring the best interest of ALL Members and community are front of mind. The dismal results above confirm that for the most part Chief & Council’s seem to be drastically missing the mark…clearly more needs to be done, and we share some responsibility in making the necessary change happen. Regardless of whether you are an elected leader, hereditary leader, community employee or community member…each us can send the message that more needs to be done. Leadership needs to pay more attention to what they are actually doing and what is expected of them as they work toward building better, healthier and wealthier communities on our behalf and generations to follow. There is no magic bullet here, but it starts with more robust leadership actions that set clear and concise goals and objectives, followed by detailed plans and metrics (guided and developed by subject matter experts), and regular assessment of compliance in reaching outcomes and objectives based on determined measurements and real data. It’s time to take an investment attitude that is based on the vision of the First Nation community and abandon the outlook that we are poverty bound and reliant on ‘funding’. Real change ultimately rest with each individual First Nation community Member – what will you do make the change you desire in your community? Thank you Lissa…same to you and yours as well! Take care and all the best in 2017!!! If everyone feels they are coming from a place of abundance life flows and magic happens. All our needs are met. Living in the present, following our hearts without an agenda. We are all one. Great insight. Need to educate the community…the grassroots folks that are on social assistance and in substandard housing to prove to anyone that this is a reality in our communities. Some folks are very reluctant to speak up because they will be targeted and/or be victimized by withholding services to them or their families. A catch 22.